The thing is, most of our thoughts are habitual and we may not even realize how our thoughts are contributing to our negative emotions. 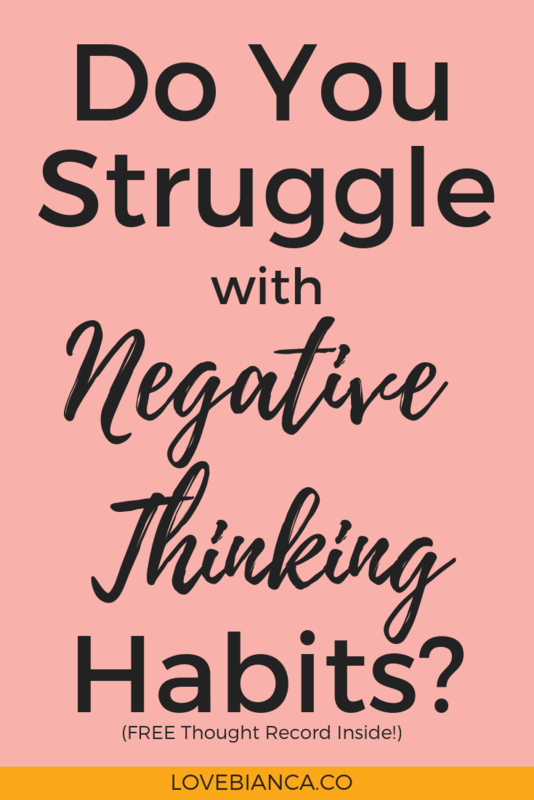 When we have a habit of thinking negative, irrational thoughts, it’s pretty easy for anxiety and depression to invite themselves to the party. Cognitive distortion sounds fancy, huh? From here on out just think of it as a way that we change something that is (in reality) to something else, usually negative (in our minds). So something happens and we twist (or distort) our perception of it based on a variety of factors (past experiences, trauma, family dynamics, our genetics, etc.) Make sense? Let’s look at a couple of examples. Black or White Thinking: You fail a test, when you’re otherwise an “A” student? Conclusion: I’m a failure. No in between. No, “I’m generally a good student and this is one bad grade”. Nope…just jump straight to failure. You’re either perfect or a failure. Mind-Reading: You have the "gift" (those are air quotes) of knowing what other people are thinking. Someone looked at you funny. They’re probably thinking about how weird you are. You’re pretty certain…can’t just be that they have indigestion and aren’t even thinking about you. You know what they’re thinking. Overgeneralizing-The one guy you loved with all your heart cheated on you, and your new mantra is, "All guys cheat!". Short version, you take one experience or one type of person and apply it to everyone or all similar situations. Catastrophizing- One little thing happens and now you think the worst possible thing is likely to happen too. Think mountain, mole hill. Your throat has been scratchy for two days...must be throat cancer. Mom hasn’t called you in two days, she’s probably been in a terrible accident. Should Statements: If you often find yourself saying, I should, must, have to...your shoulding all over yourself. Labeling- I'm (fill in the blank). Common “blanks” would be: a loser, unattractive, stupid, a failure...you get the picture. Emotional Reasoning-I feel it, therefore it must be true. There are several other cognitive distortions, but these are the ones that I tend to see most often. If you’re interested in others, a simple Google search will do. Thinking Habits in the Way? If you think that you’d like to dive a bit deeper into on this whole mind-body connection thing, sign up to be the first to know about my upcoming course, Thought School. We have Aaron Beck to thank for helping use to understand these cognitive distortions and the development of Cognitive Behavioral Therapy (CBT). CBT is by far, one of the most effective psychotherapeutic treatments for some of the most common mental health disorders, especially anxiety and depression. 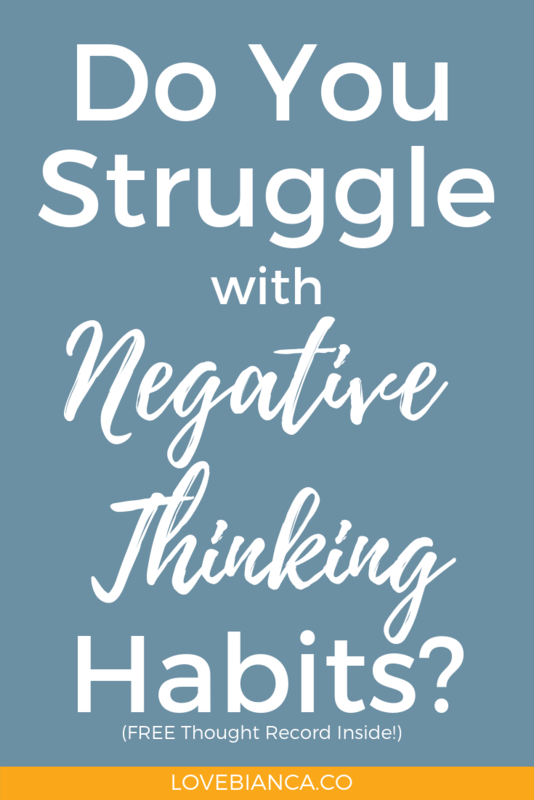 In the past, clients were taught to recognize cognitive distortions, like the ones mentioned above, and put up some type of mental stop sign (visualize an actual STOP sign or the word STOP) and then try to change their thought to something more positive. We’ve all heard, “You’ve got to think more positive”, right? But what research has shown, and what you may already know from experience, is that that only works for so long! Those annoying, pestering thoughts often tend to come back with a vengeance, like an annoying ex that you just can’t shake. So, what now? You’ve likely been sitting with these repetitive thoughts for such a long time, to the point that you may not even realize how much you think them. They’re kind of on auto-pilot. One of the first things you can do is to simply develop an awareness of your habitual, negative thoughts. What was going on at the time (what was the problem)? What thoughts went through your head? What feelings did you have, both emotionally and in your body? What was your reaction (how did you behave)? The key to a sustainable change is awareness, and becoming aware of your thought patterns is just the first step. What if you could change your relationship with the thoughts that trouble you the most? What if the same scripts that have been playing in your head for the last 20 years, no longer had the same power over your actions and emotions? Listen—this is totally possible through Acceptance and Commitment Therapy (ACT), a type of CBT. In my upcoming mini-class, Thought School, you’ll learn specific skills to not only recognize your own negative thought patterns, but you’ll also be equipped with the tools to get in the driver seat of your thinking, rather than allowing your thoughts to take you for a ride. Want more info about Thought School ? Of course you do! :) Just click the button below. And I’m curious…what cognitive distortions trip you up the most? Let us know in the comments. Interested in mental health and wellness? Me too! Let’s stay connected.